These simple Easter bunnies made from toilet roll tubes are just the right size to fit a chocolate egg like a Cadbury's Creme Egg into as a little Easter gift. You could also fill them with smaller eggs or sweets, and they are really easy to make. They are a really easy craft to do with a toddler as an Easter gift for friends or relatives. 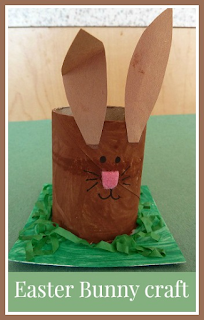 Use one toilet roll tube cut in half to make two bunnies. Paint it completely brown, and use cut out brown paper shapes for ears. I used a scrap of pink felt for the noses, but you could paint or draw a nose on, or perhaps use a pink pom pom. The base of the bunny is made from a small square of cardboard painted green with green shredded paper glued on the top for grass. They also have a small ball of cotton wool on the back for a tail, again you could use a pom pom. If you want to make some Easter egg holders on a different theme try these Easter chick egg holders made from toilet roll tubes, just paint the toilet paper tubes yellow and glue a beak and wings on to make a chick, with a base of feet cut from orange card. I'm glad that you like them! I used to make similar ones when I was little for my parents, they are really easy and little ones like them. Ha ha, well I know that you read this, so you won't be getting bunnies!